These are species whose stems never develop a woody character and that either die to the ground or loose leaves and become unsightly at the end of a growing season. This group includes both hardy and tender types. Many of the tender forms are grown as annuals in cold winter areas. 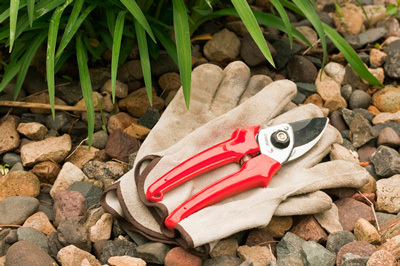 During the spring and summer, you can completely cut to the ground any stems that have finished blooming and are becoming unsightly. 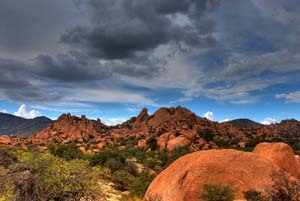 In mild climate areas, growth can be so rapid that the entire plant becomes messy and spent mid-way through the season. In this case, it can be cut back close to the ground – given a short “haircut”. The result usually is fresh, vigorous new growth and another round of flowering. At the end of the growing season or after the first frost the spent stems can be completely removed, cut to the ground. Often these are a tangled mess, and one can get great satisfaction by cutting them all off. This also facilitates good garden sanitation, and will help to control pests over the winter. (Lady in Red Tropical Sage) Lady in Red is a variety of Salvia coccinea Juss. ex Murray, which is often called Texas Sage. It is the best red-flowering Tropical Sage that we grow. (Lady in Red Tropical Sage) Lady in Red is a variety of Salvia coccinea Juss. ex Murr., which is often called Texas Sage. 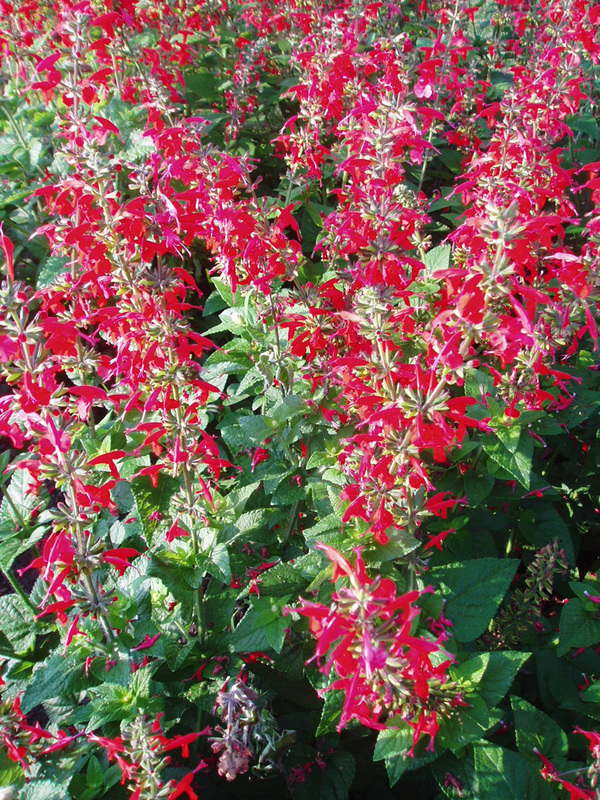 It is the best red-flowering Tropical Sage that we grow and a 1992 winner of an All American Selections award. The lush flower spikes of Lady in Red draw butterflies, honeybees and hummingbirds to the rich nectar of this Southern species and American native. 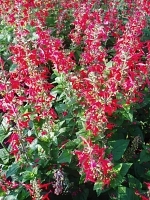 Unlike the dwarf variety of Lady in Red, which was bred by the Japanese company Takii Seed/Sahin, this is a full-sized Tropical Sage that the Japanese breeder developed in conjunction with the Netherlands firm of Zaden B.V. Fuzzy and shaped like elongated hearts, the dark-green leaves of Lady in Red are heavily veined and have serrated edges. The fragrant foliage contrasts dramatically with the long-blooming flowers. If you have persistently damp spots in your yard, Tropical Sages are good solutions due to their water-loving nature. However, they do just fine with an average amount of watering based on local rainfall. Similar to other Tropical Sages, Lady in Red thrives in full-sun to partial shade and requires rich garden soil. It is a tender perennial in areas with moderate winters and a lovely annual bedding plant elsewhere. 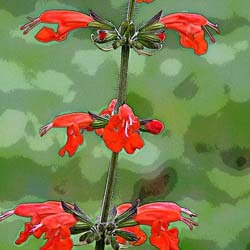 Tropical Sage (Salvia coccinea) existed in the American Southeast, Central America and South American prior to European conquest of the New World. Early plant exploration led to its naturalization in Europe and Africa. This herbaceous plant is known for its use in folk remedies. Salvias have been used as healing herbs by a wide variety of cultures in the Americas, Europe and Asia. The genus name is from the Latin term “salvare,” which means to save. When considering application of an herbal remedy to treat a medical problem, be sure to consult a physician first. Head 'em up; move 'em out. 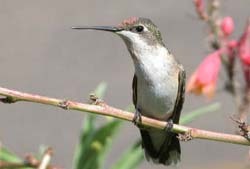 Texas birders participate in an annual Hummingbird Roundup to gather information about the state's 18 species. Many gardeners and wildlife lovers in states with recurrent drought choose to increase the number of native plants in their yards. This is especially true of Texas, where statewide drought began in 2010 and hasn't yet abated. 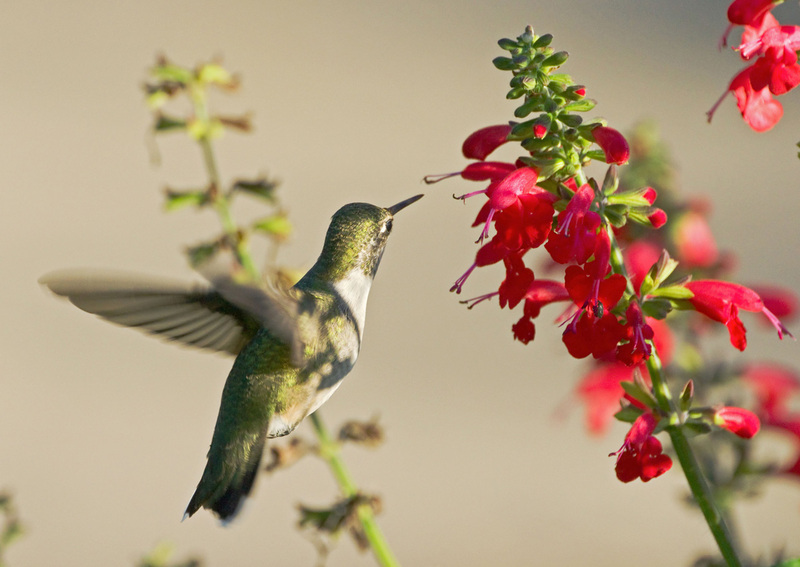 Native plants appeal to local wildlife, including pollinators. 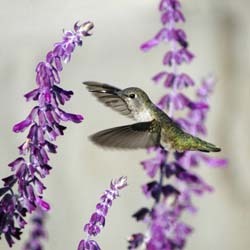 To help gardeners from Texas and the Southwest who want to create wildlife habitat, Flowers by the Sea (FBTS) suggests Salvias appropriate for Texas and Southwest gardens. 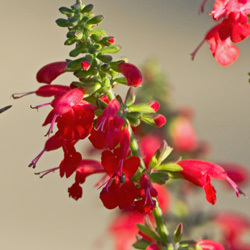 Although it probably originated somewhere in Mexico, Tropical Sage (Salvia coccinea) existed in the American Southeast prior to European exploration of the New World, so it is considered an American native. It's also native to Central and South America and has naturalized in parts of Europe and Africa. Medical researchers think its phytochemicals may fight illnesses caused by inflammation and oxidative stress from free radicals. 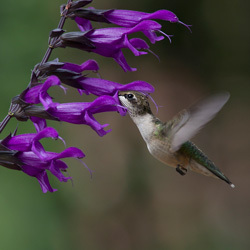 Regional differences in seasonal temperature and humidity affect the choice of Salvias to plant in hummingbird gardens. 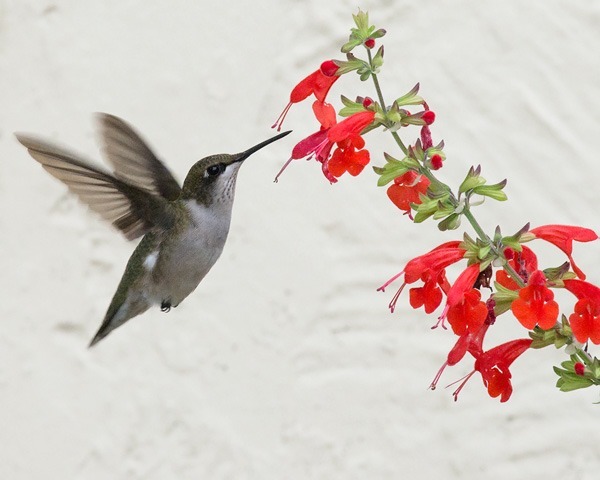 The varying seasons in which particular sages bloom and the part of the world where they originated also determine whether they attract hummingbirds. Flowers by the Sea offers suggestions based on regions and seasons. I enjoy the deep red flowers of your wonderfully tall Salvia coccinea 'Lady in Red'. So do the hummingbirds. They are working my gardens every day now getting ready for southward migration and are, invariably, drawn to many of my FBTS plants. (Cundinamarca Sage) This Colombian Salvia is difficult to obtain outside of its home country. As far as we know, Flowers by the Sea is the first nursery to offer it in the United States. (Summer Jewel Pink Tropical Sage) Butterflies, hummingbirds and honeybees enjoy this Fleuroselect Gold Medal winner, which is an outstanding choice for bright pink & white color from June to autumn. This type of Tropical Sage is generally the first to flower for us. Very well grown healthy plants. The best mail order plants I have received from numerous growers. For the size of the plants they were priced appropriately.